Getting a great deal on tyres does not mean that you have to sacrifice safety or peace of mind. This is why ATS Euromaster now has a tyre clearance range including the most trusted brands at the best prices. If your local centre does not have any clearance tyres suitable for your vehicle, you can still find tyres to suit every budget on our website using the tyre search tool further down this page. In order to find our cheapest tyre deals, you will first need to find your local centre by searching below. Once you have found your nearest centre you will be able to see all the stock clearance tyres available for purchase. Our stock clearance deals are only available to purchase in centre but will be some of the best priced tyres in the UK. Once you have completed step 1 the next step is to contact the centre to reserve your chosen tyres and arrange a suitable appointment to get your cheap tyres fitted. If there are no stock clearance tyres available in your size, you can still find available tyres online to buy using our search widget below. How can we offer such value for money? 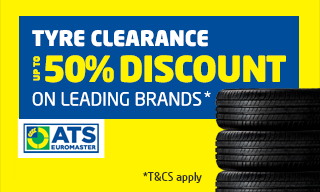 At ATS Euromaster we’re able to offer cheap prices on clearance tyres as a result of unfulfilled bookings, special buys, end of line products and surplus stock held by our Service Centre network. If your local centre does not have any clearance tyres suitable for your vehicle you can still find tyres to suit every budget on our website. Simply enter your tyre size below to see the options we have available for you, you can then order your tyres and book an appointment online at a date and time to suit you. ATS Euromaster has a limited number of Tyre Clearance products available at certain ATS Euromaster Service Centres. These Tyre Clearance products are tyres which are available due to unfulfilled bookings, or they may be end of line products or they may be surplus stock at that Service Centre. Insert your post code to take you to your nearest Service Centre [landing] page to see which Tyre Clearance products are available at that Service Centre. ATS is unable to transfer Tyre Clearance products between Service Centres. The Tyre Clearance prices are available on limited numbers of selected sizes and brands of tyres as stated on this website. When these tyres have been sold ATS Euromaster’s Retail Centre Price List, which is current at the time of supply, will apply. The Retail Centre Prices will be provided upon request. Tyres of the same brand, size and pattern (so long as they have not been discontinued) may also be available at other ATS Euromaster Service Centres. The ATS Euromaster Retail Centre Price List price will apply to those tyres. Please contact the Service Centre for details. All Tyre Clearance products displayed on this Website must be fitted at an ATS Euromaster Service Centre or by way of ATS Euromaster's Mobile Service. The Mobile Service is subject to an additional charge and is available at selected Service Centres only. All Tyre Clearance products are sold under ATS Euromaster Terms and Conditions. We reserve the right to change these terms at anytime.